Rembrandt Charms is family-owned business that is famous for superb craftsmanship and an impressive collection featuring thousands of charm styles. Rembrandt earned the title “World's Largest Charm Collection” because they offer each charm style in five different precious metals: 14k yellow gold, 14k white gold, sterling silver, gold plate, and 10k yellow gold. This extensive versatility is one of the many reasons why we at Schmidt Jewelers are very pleased to carry this line of fine charms for you and all our customers in and around the Arkansas City, KS area. Since Rembrandt is very proud of their tradition as a family-owned business that has been designing and manufacturing charms and charm bracelets for over 40 years, they support the independent jewelers where their designs can be found. We invite you to visit us at Schmidt Jewelers to experience the Rembrandt Charm Collection™. With styles for all interests and occasions, we're certain you'll find a special charm (or charms) to celebrate the special events and precious milestones in your life and in the lives of all those you love. 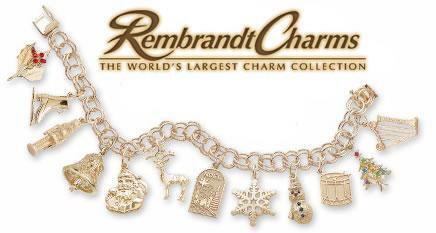 We also have Rembrandt charm bracelets and charm holders to feature your beautiful Rembrandt Charms. If you look around our catalog, you'll see a few examples of Rembrandt’s vast charm collection. With such categories as Love & Marriage, Holidays, Religions, Hobbies & Professions, Special Occasions, Animals, Home & Garden, Travel, and Sports, Rembrandt really does have charms for just about everything! If you are looking for something specific, please stop in to Schmidt Jewelers and speak with one of our helpful and trained jewelry consultants or contact us via our contact page. And remember, all Rembrandt products are backed by a lifetime warranty. Whether you're purchasing a Rembrandt charm, a diamond engagement ring, a holiday gift for mom, or any other fine jewelry piece, Schmidt Jewelers is here to give you the confidence to know that your jewelry purchase is a quality piece at fair value. If you have any questions about our jewelry or services, please don't hesitate to ask. We're here to assist you in every manner of jewelry ownership from the initial purchase to the care & cleaning.